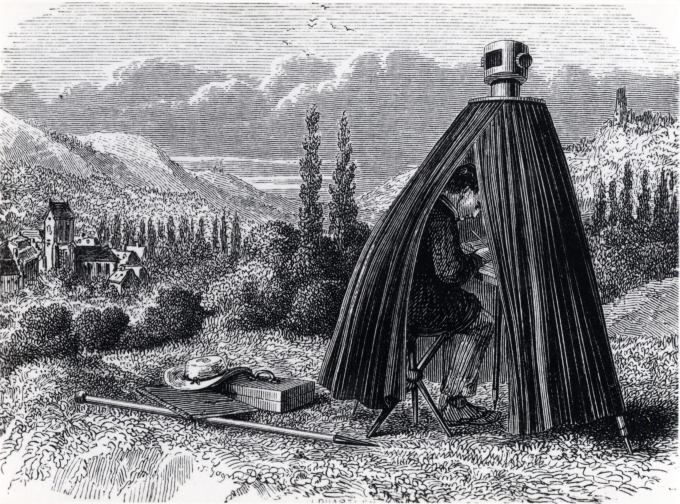 The Camera Obscura translates from Latin as (Vaulted Chamber/Dark Room) was an early example of image acquisition. is an optical device that projects an image of its surroundings on a screen. 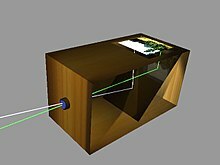 The device consists of a box or room with a hole in one side. Light from an external scene passes through the hole and strikes a surface inside where it is reproduced, upside-down, but with color and perspective preserved, it was used by many early artists to trace their work and eventually, with the use of the camera lucida led to a revolution of artistic style and in the end, the camera. Using mirrors, as in the 18th century overhead version, it is possible to project a right-side-up image. 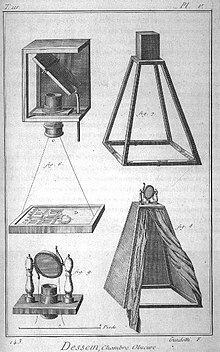 Another more portable type is a box with an angled mirror projecting onto tracing paper placed on the glass top, the image being upright as viewed from the back. As a pinhole is made smaller, the image gets sharper, but the projected image becomes dimmer. With too small a pinhole, however, the sharpness worsens, due to diffraction. Some practical camera obscuras use a lens rather than a pinhole because it allows a larger aperture, giving a usable brightness while maintaining focus. ← What Kind of Journalist Am I?